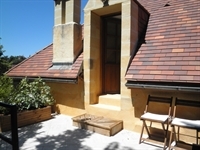 This detached property is in Sarlat centre and about 4 minutes level walk to the medieval city walls. It is surrounded by grounds of about 2300 sqm and has a private driveway with parking for up to 6 cars. The floor area is about 250 sqm with four letting units and owners accommodation. Currently it is operated between April and October but the season could easily be extended. Whilst we do not operate to full capacity it could easily gross €50k for the six months. For more details please contact seller. There are many B&Bs but always demand for rooms and especially accommodation with private parking.